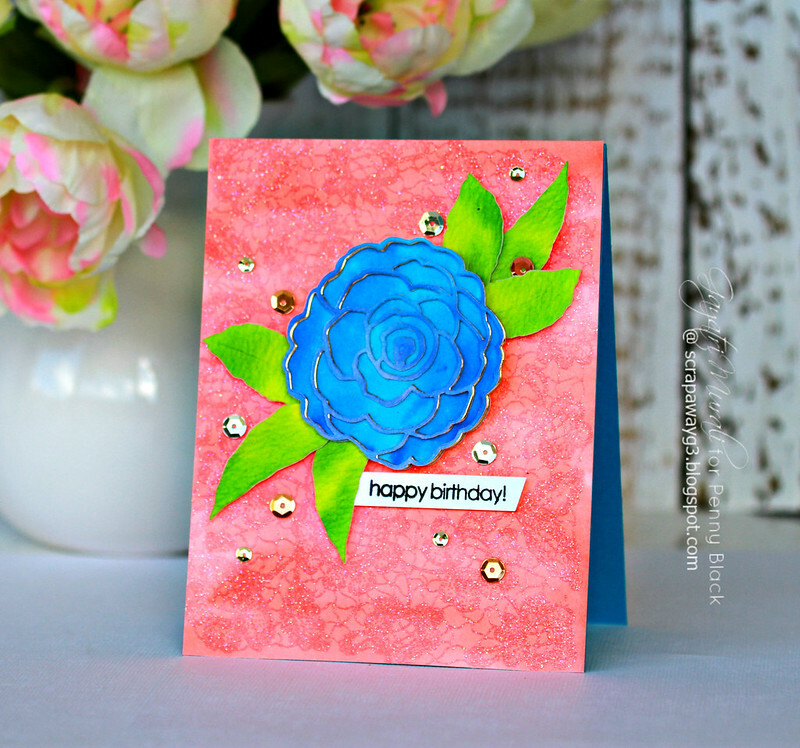 A Bright and Colourful Penny Black Card! I watched Jennifer McGuire’s video on watercolour lifting technique and loved it so much that I wanted to try it. I did have all the stuff I needed for the technique. So I gave it a go. 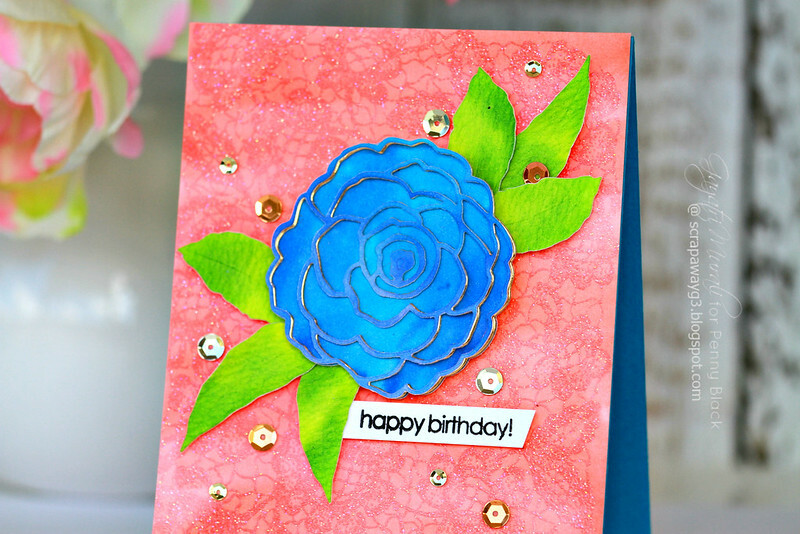 I used a background stamp and distress inks on my card below. I have used Floral Thread cling background stamp from Penny Black on my background. I coloured the watercolour paper with Abandoned Coral distress ink, then clear embossed the background image. Then added lots and lots of water and dabbed them off lifting the colour. I got a beautiful darker background image and lighter coral colour on the rest of the area. I intentionally did not add lots of colour because I wanted a muted background not too much of a contrast. This came out perfectly as I wanted. 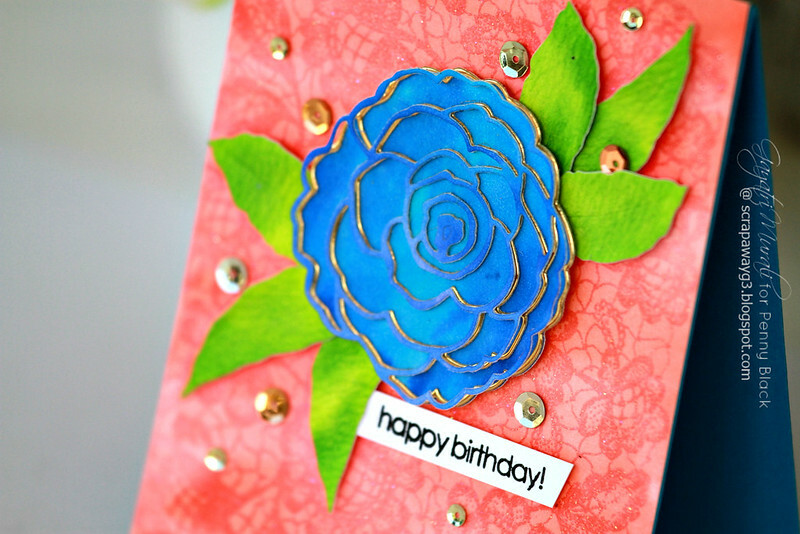 For the focal point, I have used Camellia die. I also did watercolouring using distress inks on the flower and leaves. For the flower, I layered the base of the flower with gold outline layer and again with the blue outline of the flower slightly offsetting. This shows a little tiny amount of gold. The sentiment is from Happy Notes stamp set. To added a bit more gold, I added some gold sequins. Here are the Penny Black stamp set and dies I have used on my card. All the three products are available from Penny Black store.